Another great battle and nail bitingly close for most of the way through & could’ve gone either way several times. But the necrons toughness & resilience saw them through! I think in hindsight I should’ve saved the points on the wolf guard in termie armour (again failed to live up to billing!) and either gone all out shooty or all out assault, rather than falling between two stools! Great game. I was extremely lucky with the deny the witch rolls. I think the one on the Overlord turned the game in my favour. If i’d have lost the Overlord at that moment the Space Wolves would have had the upper hand. The game was for me was really stretched. Deploying along the short edges and fighting length ways meant I couldn’t hold objectives and bring guns into play (Anything above 24″ was destroyed when the drop pod landed). I had to use the Fast Attack units to do the damage even though it put them up for Victory Points. I think the Wraiths took a couple of extra shots to die than needed. A couple of those I think would have been instant death. Jink roles on the Barge! Still not impressed with the Flayed Ones – I think they’ll be dropped for the next game. The Destroyers were bettter in the heavy format but losing them to the drop pod early meant I didn’t really get to see what they could do. 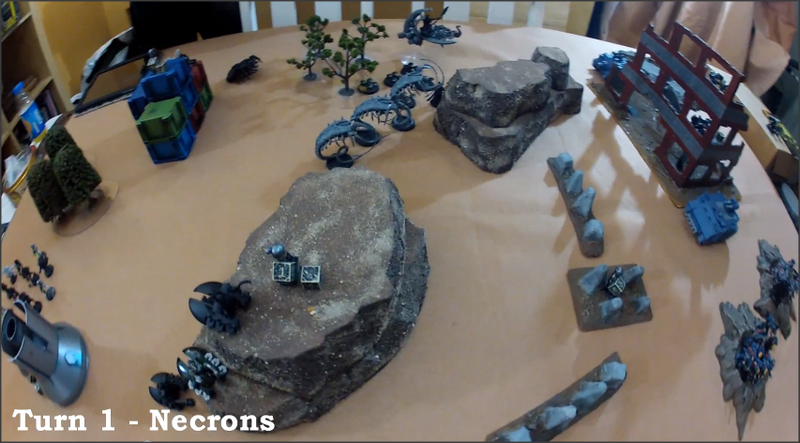 Overlord again was worth his points tally, The crypteks add that something special to the troop squads and as for the Spyder and Scarabs…..